It's the question I'm most asked: What's the single-greatest factor when determining your more-prized than rhodium Final Cut® score for a film? In a proverbial nutshell: How engrossingly entertaining is it — how dialed in to the screen was I? 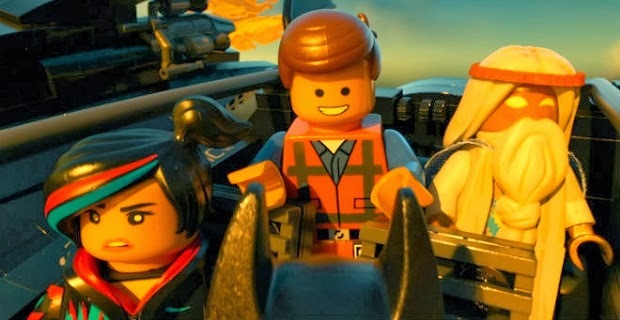 By that measure, The Lego Movie comes as close to perfection as any project essentially could, it's a giddily-buoyant, blindingly-imaginative, utterly-riotous slice of escapist bliss that teeters on the brink of brilliance. Yeah, it's that freaking good. Immersing us in their vibrant – hyper-witty – world of interlocking blocks (a dizzying, smart hybrid of stop-motion Legos & CGI), the directorial duo, Phil Lord and Christopher Miller, introduce Emmet (Chris Pratt doing "dim" quite convincingly), an uber-assimilative Lego man, constantly clasping a board of instructions with his claw hands, obeying whatever his plastic universe dictates the commercial norm — the average homogenized American consumer in minifigure form. With the poptacular electronica anthem "Everything is Awesome" incessantly blaring throughout the city of bricks, Emmett and his crew of construction chums detonate anything and everything that doesn't meet President Business' (Will Ferrell) uniformity — as with real life, going off script with your blocks is frowned upon in favor of strict adherence to the 78-part directions. But there's push back from free-thinking radicals like Wyldstyle (Elizabeth Banks), a hoodie-wearing hellion hunting for the Piece of Resistance, the literal cap to Business' plan to release his chemical weapon, the Kragle, upon his unsuspecting lemmings. Stumbling upon the protective piece of plastic, Emmitt – like Frodo before him – begins the pilgrimage to Business' mile-high skyscraper lair, looking to thwart the prez's maniacal scheme, aided by rag-tag rebels including Vitruvius, a glowing-eyed Gandalf (Morgan Freeman eliciting gut-busting guffaws) and The Dark Knight himself, Batman (Will Arnett slaying it with his gravelly-voiced one liners). There's a profusion of The Matrix, The Lord of the Rings and Star Wars influence on display; the latter two pop up in brick form with hysterical results. As they proved with their big screen debut, Cloudy with a Chance of Meatballs and their sophomore outing, 21 Jump Street, Lord and Miller get comedy, flooding the razor-sharp – anarchical – script (co-penned by Dan and Kevin Hageman) with self-reverential, satirical humor, the kind of lightning-round laughs you'd find on The Simpsons or Family Guy — minus the crudities. This is a family film, one that will work wonders for any age, featuring a final twist that's nothing short of magical. Damn, I love this movie. A month into the year, a spot in my top 10 of 2014 has been locked down. Heck, The Lego Movie could legitimately contend for the top spot.